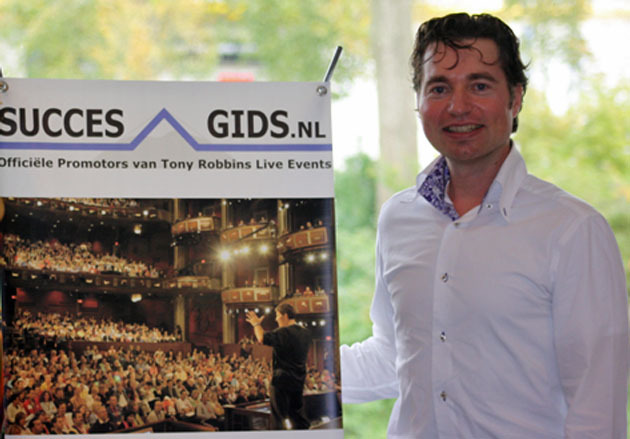 I'm looking forward to being one of the guest speakers at a major personal development seminar in The Netherlands next week. 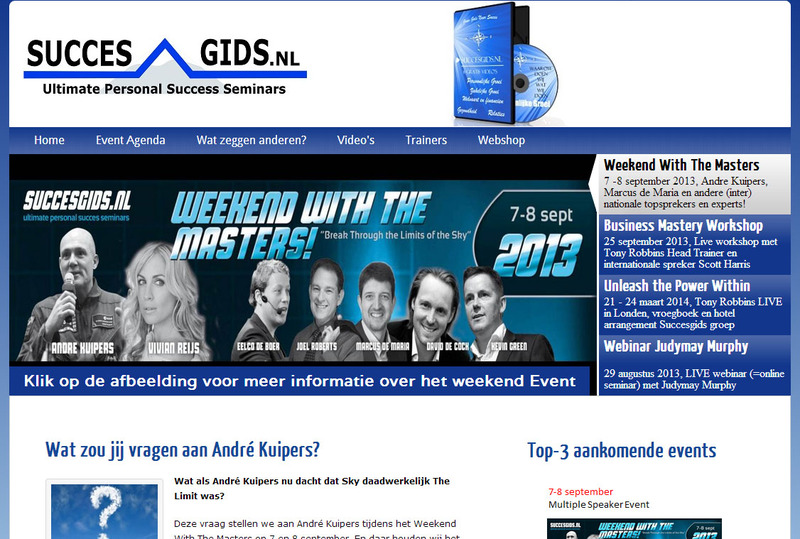 'Weekend with the Masters' is a two-day seminar being run by my good friend Arnout Van Der Swaluw, owner at Succesgids (Success Guides) and promoter of high level business and personal development seminars. It takes place on Saturday and Sunday, September 7 and 8, at the Claus Event Center in Hoofddorp, which is close to Amsterdam's Schiphol airport. As a warm-up to the event, earlier this month, I took part in a special Q&A 'webinar' with many of the delgates. Other speakers at the event include André Kuipers, the first Dutchman in space, with two astronaut missions under his belt; Netherlands TV presenter Vivian Reijs; Marcus de Maria, a respected trainer in the field of welfare and investment, and internet expert Eelco de Boer. I will be speaking to some of my favourite themes - repossession rescue, repairing credit history and how to set up a business. Work started last week on the FREE boiler upgrades to a number of our properties. These installations are part of the drive by the Government to improve the efficiency of heating and energy usage in homes in the UK. With more than 650 properties that are eligible for the upgrade, this is a significant move which will help my tenants with cheaper heating bills this winter. Some of the upgrade work will also see new radiators installed. If new radiators are not appropriate for the property, then current 'rads' will be fitted with a 'Magnaclean' device to clean the system. The boilers will all be A-rated appliances, fitted by Gas Safe engineers using our own Terms of Expectations – which means that the boilers are being fitted to our standard. All the pipework will be hidden and under floorboards etc. This massive upgrade follows the recently-completed task of insulating all of the properties, beyond the Government guidance by filling the cavity walls and laying loft insulation to 270mm (UK Government guidelines currently recommend insulation up to 250mm). The work is all intended to improve tenants' energy costs – and these upgrades have all been conducted on the properties free of charge. There are more FREE energy saving measures currently being undertaken on the property portfolio including stone wall insulation (which involves adding insulation boards to the outer walls and then re-rendering the properties). Finally, our Lettings and Property division staff are also currently negotiating to replace all the windows on the properties with A-rated windows which are made using an invisible coating of metal oxide, with the gap between the panes filled with argon. All of these measures are being installed to help our tenants with their energy costs. On the plus side, all of the upgrades have increased the value of the properties – FREE of charge! I will explain to you how to do it! I'm a very 'chuffed' (delighted) dad today as my 17-year-old son Carwyn has just enrolled on a business and entrerprise course at Coleg Sir Gar, Carmarthenshire's sixth form college. Great to see Carwyn showing an interest in business! I'm back in the groove after a splendid two-week break with the children in Spain. A lovely relaxing time and great to return to find that John-Paul has done a brilliant job on keeping the HQ office ticking over. Batteries now fully recharged and looking forward to a very busy autumn.